President Donald Trump speaks about North Korea at a meeting with administration officials on August 8th, 2017. Fifty-five years ago, the Cuban Missile Crisis, a tense 13-day standoff between the United States and the Soviet Union over intercontinental ballistic missile deployments, brought the world as close to total annihilation as it&apos;s ever come. 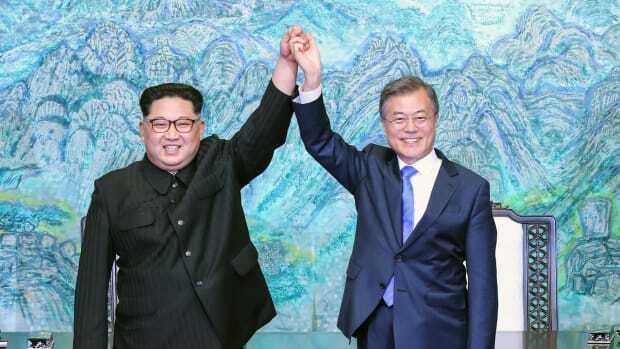 After a two-week dance of photoreconnaissance satellites, light bombers, and a U.S. naval blockade in the Gulf of Mexico that technically constituted an act of war, the end of the crisis signaled not just a triumph of diplomacy, but a renunciation of reckless brinksmanship. 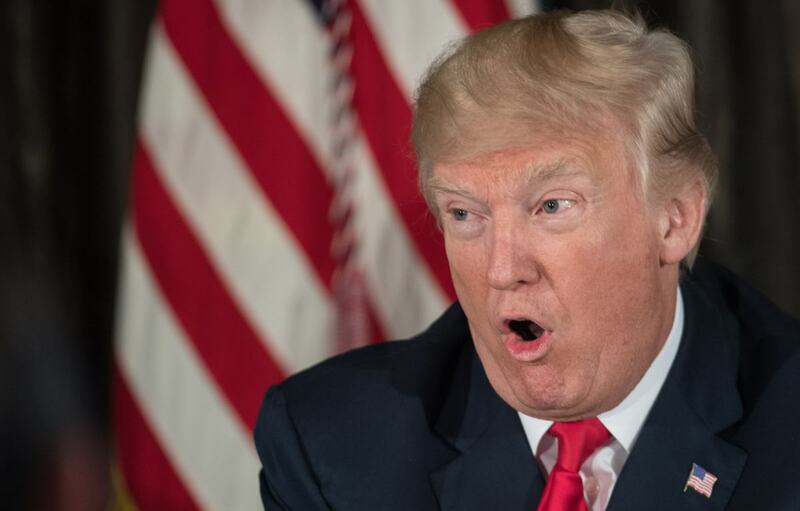 But with President Donald Trump and North Korean dictator Kim Jong Un continuing their back-and-forth exchange of threats, it would appear the U.S. government failed to learn the right lessons from Cuba, namely the dangers of nuclear one-upmanship. 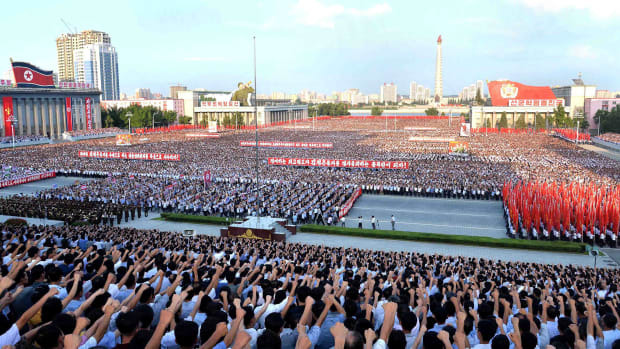 The American nuclear arsenal and missile defense shield now stand on alert for the new-and-improved Hwasong-12 intermediate-range liquid-fuel ballistic missiles tested successfully by North Korea in May (which come topped off with miniaturized nuclear warheads described in a Defense Intelligence Agency report made public by the Washington Post on August 8th). The DIA had made the exact same claim in 2013, despite disagreement in the intelligence community; this time, other agencies like the Central Intelligence Agency have agreed with the assessment. With this build-up of nuclear weapons has come more bombastic rhetoric. And even without the red telephone between D.C. and Pyongyang, the logic of "cooler heads" prevailing seems lost amid not just Kim&apos;s bluster, but also Trump&apos;s hard line against North Korea (not to mention Secretary of Defense James Mattis&apos; declaration that a North Korean strike against Guam would signal "game on" to the U.S. military). But it&apos;s not entirely Trump&apos;s fault: Despite promises of increased non-proliferation efforts to reduce the threat of a nuclear holocaust, the U.S. has done little in recent decades in the way of beating back its own nuclear establishment—and its main security measure, the off chance that an elected leader will actually recognize the world-historical responsibility of weapons of mass destruction, appears a poor bulwark against a nuclear holocaust. To truly understand the makings of the North Korean nuclear crisis, we need to look back to the moment that changed everything: September 11th, 2001. The dawn of the Global War on Terror helped transform America&apos;s post-Cold War approach to nuclear weapons. Almost eight years after the 9/11 attacks burned the specter of Islamic terrorism across every screen in America, then-Secretary of State Condoleezza Rice claimed the Bush administration had left the U.S. nuclear non-proliferation regime "in far better shape than we found it." But President George W. Bush&apos;s forceful post-9/11 military doctrine—direct, often preemptive military action against not just terrorist groups like the Taliban and al-Qaeda, but nation-states like Iraq—came with a renewed nuclear threat to the U.S. The administration&apos;s 2002 Nuclear Posture Review detailed the need for "a broader array of capability," Secretary of Defense Donald Rumsfeld put it at the time, "needed to dissuade states from undertaking political, military, or technical courses of action that would threaten U.S. and allied security." Non-proliferation isn&apos;t just about loose nukes and rogue states, but America&apos;s own nuclear stockpile. Bush had some victories when it came to non-proliferation: Libya&apos;s late ruler Muammar al-Qaddafi in 2003 renounced his nuclear and chemical weapons programs thanks not to the example of Saddam Hussein in Iraq, but negotiations stretching back to the early weeks of the Bush administration; a year later, Pakistani nuclear scientist Abdul Qadeer Khan revealed the existence of a global proliferation market that had fueled nuclear programs from Pyongyang to Tehran. 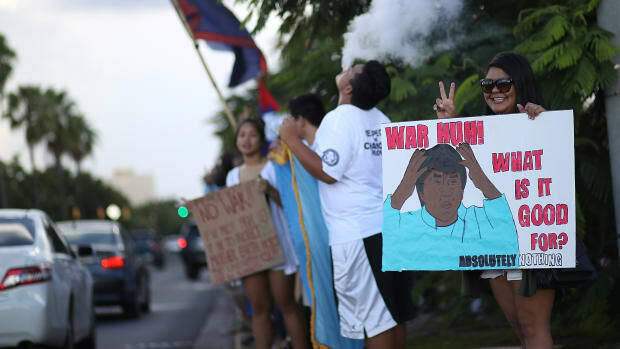 In April of 2004, the United Nations Security Council passed Resolution 1540, a U.S.-backed requirement to increase enforcement of legal, economic, and diplomatic non-proliferation programs. But those efforts were for naught. A 2008 Pentagon-commissioned report on U.S. non-proliferation efforts found implementation hamstrung "primarily by lack of interagency coordination and long term strategy, mismatch of U.S. and foreign expectations" and, ironically, "lack of host country buy-in to ongoing program goals"—like North Korea, which first tested a nuclear weapon in 2006, and Iran, which easily rebuffed diplomatic efforts by Bush&apos;s Department of State to scale back its uranium enrichment program. There was also the issue of funding: non-proliferation funding barely increased after early victories in 2005. President Barack Obama fared significantly better than Bush on non-proliferation, and with good reason: he&apos;d made nuclear a pillar of his 2008 campaign and, months after laying out his vision of a nuclear-free world in Prague&apos;s Hradčany Square, picked up the 2009 Nobel Peace Prize for his "vision of and work for a world without nuclear weapons." And the early years of his presidency, like Bush&apos;s, yielded substantial achievements: the 2010 New START treaty that committed the U.S. and Russia to reduce their nuclear warhead stockpiles and deployed (and non-deployed) missile launchers, a treaty that appears to be kind of, sort of working. And the Iran nuclear framework is undeniably historic, especially in the wake of the U.S.-led Stuxnet attack on an Iranian reactor. 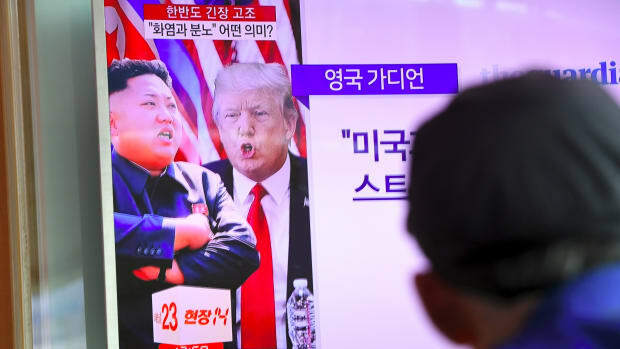 But the Obama administration faltered when it came not just to curbing North Korea&apos;s nuclear program, but curbing non-proliferation in general. As I wrote in Pacific Standard in 2016, America&apos;s souring relationship with Russia over the annexation of Crimea and Syria&apos;s civil war didn&apos;t just throw a wrench in the implementation of the New START, but damaged the government&apos;s relationship with the world&apos;s biggest source of loose nuclear materials. This is especially disturbing given a June of 2015 report that indicated ISIS militants had already gathered enough nuclear material to build a dirty bomb after seizing more than 80 pounds of uranium in Iraq in 2014. 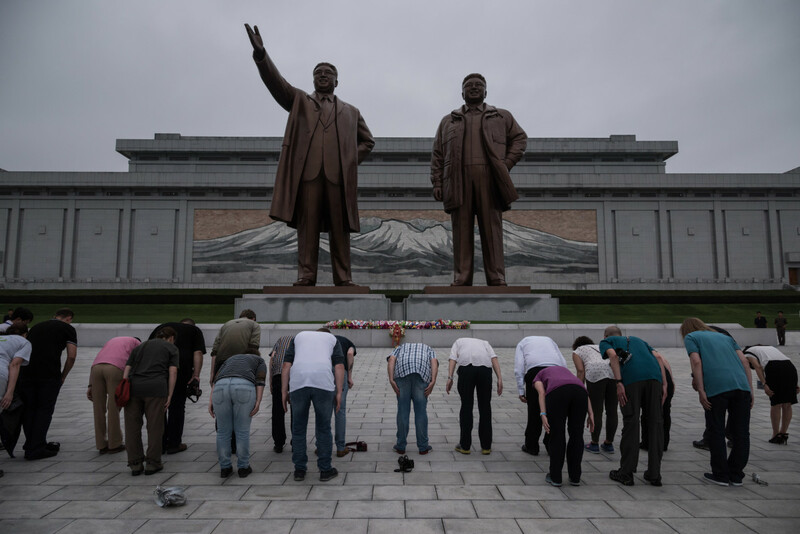 A group of tourists bow before statues of late North Korean leaders Kim Il-Sung (left) and Kim Jong-Il in Pyongyang on July 23rd, 2017. More importantly, the Obama administration made a promise regarding the U.S.&apos;s own nuclear stockpile and promptly broke it. While the 2010 Nuclear Posture Review ostensibly committed the Pentagon to "a multilateral effort to limit, reduce, and eventually eliminate all nuclear weapons," the Obama administration&apos;s 2017 defense budget request called for a $1.8 billion boost to nuclear spending "to overhaul the country&apos;s aging nuclear bombers, missiles, submarines, and other systems," according to Reuters. And as modernization spending rose, non-proliferation spending fell, according to data from the Center for Arms Control & Non-Proliferation. 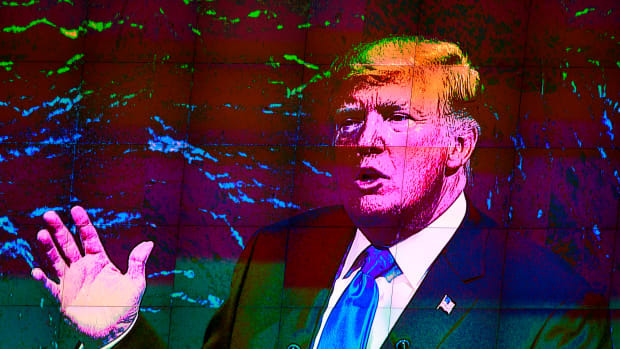 Despite the reduction in warhead stockpiles under New START, the U.S. nuclear establishment has only hardened, ready for action at a moment&apos;s notice. Non-proliferation isn&apos;t just about loose nukes and rogue states, but America&apos;s own nuclear stockpile. While Bush and Obama spent the early parts of their administrations fighting terrorists and jousting with Russia and Iran, the National Nuclear Security Administration&apos;s budget has more than doubled from $6.2 billion in 2001 to $13.9 billion in 2018, mostly focused on the "modernization" that Trump claimed responsibility for in the first six months of his administration. And this was the sad logic of the Cuban Missile Crisis: The institutions and mechanisms of our nuclear doom can keep growing and expanding so long as only cooler heads prevail—and, at the moment, we have none. How Trump Inadvertently Eulogized an Anti-Nuclear Russian Folk Hero at the U.N. 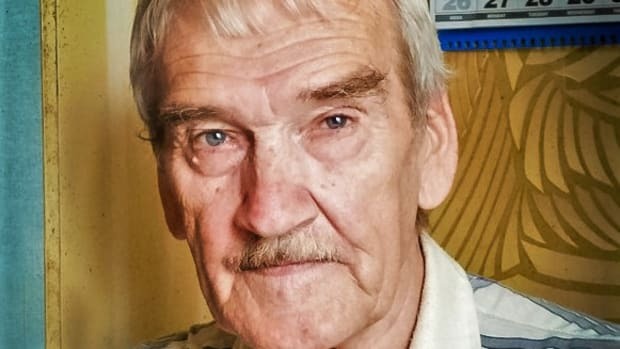 In 1983, Stanislav Petrov saved the world from a catastrophic nuclear exchange. Decades later, his reasoned calm is sorely missed.